Matt Russell, Drake University Agricultural Law Center – and a fifth generation Iowa farmer – weighed the importance of engaging non-operator landowners. 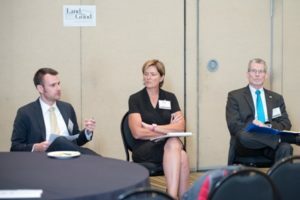 Dan Bigelow, USDA’s Economic Research Service, Peg Petrzelka, Utah State University, and Chris Beyerhelm, USDA’s Acting Administrator of the Farm Service Agency led a roundtable discussion on the needs and challenges of serving non-operator landowners. Jim Hafner, Executive Director for Land For Good, led a session on how to reach non-operator landowners who are interested in making their land available for agricultural use. Non-operator Landowners’ (NOLO) characteristics and needs were explored, including public lands, women on the land, and connecting NOLOs and seekers. This track explored the range of non-operator agricultural landowners (NOLO), including retired farmers, other private owners, and public and institutional land holders. Among the key challenges discussed were finding and reaching NOLOs, connecting landowners with farm seekers, understanding NOLO demographics and needs, and educational programming and support for NOLOs. Non-operator landowners (NOLOs) play a crucial role in agricultural land tenure and management. This session focused on their needs and challenges, along with the programs that serve them. Everybody’s talking about “connecting” landowners and farmers. What does that mean? What works and what’s needed? A frank look at programs and obstacles. An investigation of farming and ranching agreements on federal, state, county and municipal properties. Presenters shared strategies, and explored ways to expand and improve the role of these land holders. Few services exist for non-operator landowners. 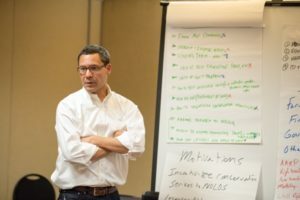 This roundtable brainstormed successful and emerging practices to engage, educate and support NOLOs, from making land their available to working with USDA programs. Exemplary and emerging programs for women who hold or seek access to agricultural land. Boulder County (CO) program that leases nearly 15,000 acres of county land to 70 tenants at below market cash rents. Some challenges with this model. Connecticut identifying state lands to lease for farming; developing process to address competing goals. Southbury Training School is first example. Countryside Conservancy (OH) manages leasing program on federal parkland; model adapted from Europe. Lease-to-own on county land (forced sale), Tierra Vegetables in Sonoma County (CA). Annie’s Project educates women farmers and landowners. 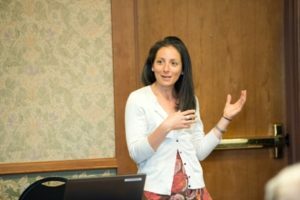 Women, Food and Agriculture Network (WFAN) supports women landowners with women-only events, talking circles, and information on conservation and negotiating leases. FSA pilot program: postcards to NOLOs in Iowa. Low return but worthwhile. Planning to expand to other states. 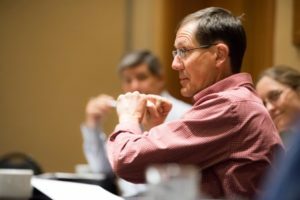 Ag retailers (e.g., crop consultants, fertilizer sales reps) to be conduit between farmers and landowners around stewardship [Utah State University and AFT research]. CT Farmland Restoration Program: cost-share to bring old farmland back into productive use. Develop a membership organization specifically for NOLOs, modeled after AARP. Network/website of referrals and resources for NOLOs. Encourage farm management companies to foster good NOLO landlord practices and behaviors. SILT has done some work on this in IA. AGREN works with NOLOs on conservation. Use Current Use tax programs to incentivize more secure tenancy (e.g., minimum multi-year lease term as in Vermont). Have USDA repeat TOTAL survey every five years and in all states. Iowa mandates NOLO survey every five years; USDA surveys forestland owners every five years. How to categorize and understand NOLOs; by motivations/goals, gender, age, farming v. non-farming v. retired, on-site v. absentee, single owner v. group of heirs, decision-maker v. legal owner, geography/distance from property, scale/type of operation, renting v. not presently renting. Cross-reference land ownership databases with farm program databases to identify NOLOs. Demonstrate that conservation practices enhance land value and improve returns to capital.